Christmas might be over but panto season is still in full swing and on a gigantic scale at Sheffield City Hall, were Manor Operatic Society are performing Jack and the Beanstalk, their annual panto until next Sunday (8th January). The panto delivered its promise of thrills, spills and plenty of laughs as the story was brought to life on stage, complete with rousing sing-alongs, spectacular dance routine, hilarious slapstick comedy and audience participation and everything else you come to expect from a high quality panto, as well as indoor fireworks, fluorescent puppetry, bog monsters and even a couple of dinosaurs. My stand out cast members include James Smith as Jack who mixed boy band voice and looks with the charisma of a children’s television presenter, Robert Spink as Dame Tilly Trott whose talent came through at it’s best when interviewing the children who came on stage at the end for a game of musical buckets, Emily Mae Hoyland as the princess whose singing voice especially during her second half solo number perfectly merged pop princess with Disney princess, Emma Holmes and Christina Rice as the good and wicked fairies whose own “Wicked” solos displayed voices worthy of a West End stage, Simon Hance as Far Cart the tax collector who could give the “Chitty Chitty Bang Bang” child catcher a run for his money, and Chris Hanlon as Simple Simon and Gary Rossiter and Andy Finnerty as Sniff and Whiff, whose characters were this panto’s equivalent of Buttons and the ugly sisters and left the audience in stitches. In a show full of original and re-written songs (including great versions of “Let me entertain you”, “Build me up buttercup”, “Floral Dance”, from my favourite unexpected scene “Everybody walk the dinosaur” and from the finale a song that made my boyfriend want to see “Aqua”), cheesy but original jokes, a food fight involving hot cross buns and custard tarts, outstanding costumes and and crisp choreography and voices, praise has to go the ensemble, full band and its conductor, producer and director Richard Bradford, director and choreographer Linda Kelly, musical director and assistant musical director Andy Collis and Matthew Symonds, wardrobe mistress Lynn Jackson and the rest of the backstage crew. 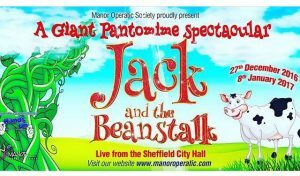 Manor Operatic Society, based in Sheffield, is one of the largest amateur theatre companies in the UK. Formed in the 1950s on the city’s Manor estate, the company has a cast of over 50 members and now produces the biggest amateur pantomine in England, attracting a total audience of over 25,000 each year (over 25,002 including me and my boyfriend). Entertaining for children and adults alike, your last chance to see Jack and the Beanstalk is this Friday (6th January) at 7.15pm for a captioned performance, Saturday (7th January) at 2pm and 6.15pm and last but not least next Sunday (8th January) at 2pm. Ticket prices range from £19.50 to £5.50. To book telephone 01709 365108 after 10am. If you get the answerphone please leave a message and you will be called back. Can’t get hold of a ticket or don’t think panto is your thing, Manor Operatic Society are also performing my favourite musical of all time Singin’ In The Rain at Sheffield City Hall from 10 to 13 May. A must see, especially following the sad news of Debbie Reynolds death last week, tickets are available online at www.sheffieldcityhall.co.uk/events/Singin-in-the-Rain or in person or by telephone from the Sheffield City Hall box office on 0114 278 9789.